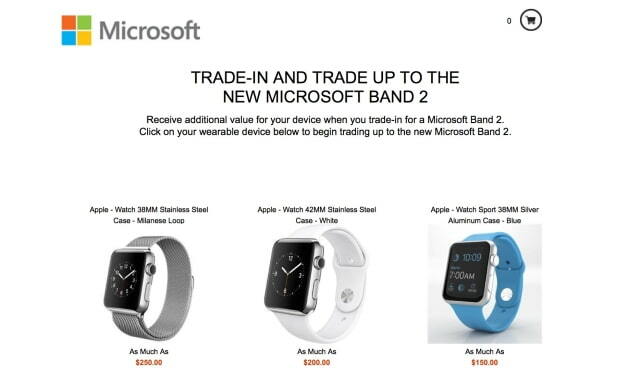 Microsoft has launched an Apple Watch trade-in program in hopes that customers will switch from the Apple Watch to the new Microsoft Band 2. The company is offering "as much as" $150 for the Apple Watch Sport 38MM Silver Aluminum Case - Blue Sport Band model, $200 for the Apple Watch 42MM Stainless Steel Case - White Sport Band model, and $250 for the Apple Watch 38MM Stainless Steel Case - Milanese Loop model. The retail prices for those models range from $349 to $649. The Microsoft Band 2 offers tracking of heart rate, calorie burn, and sleep quality and tracking for running, biking, golf, and other activities. It lets you receive email, text, calendar, and call alerts on the go and features 11 sensors, including GPS, UV monitor, and barometer. Would you ever consider using a Microsoft Band 2 instead of an Apple Watch? Let us know why or why not in the comments!